SSC has released the marks of the candidates who had appeared for Combined Recruitment of Junior Hindi Translator, Junior Translator, Senior Hindi Translator and Hindi Pradhyapak Exam 2016. Candidates can check the marks of Paper 2 at ssc.nic.in. Staff Selection Commission / SSC had declared the result (Paper 2) of Combined Recruitment of Junior Hindi Translators Examination, Junior Translators, Senior Translator and Hindi Pradhyapak Examination, 2016 on 03 October. The exam was held on 19 June and result of paper 1 was declared on 12 August. A total of 1076 candidates have been declared qualified for document verification on the basis of cut- off fixed by the Commission in an approximate ratio of 1:2.5. Candidates who have appeared for the examination have been expecting the SSC translator exam result with much eagerness. It is for the information of candidates that revised options may be submitted by the candidates during the document verification, if they desire as per the qualifications possessed by them and specific requirements of the different posts, which will be final. If options are not revised, the option submitted in the applications will be accepted as final. The result list given below is provisional. Candidates have to appear for document verification. Candidates who do not attend document verification will not be considered for final selection. 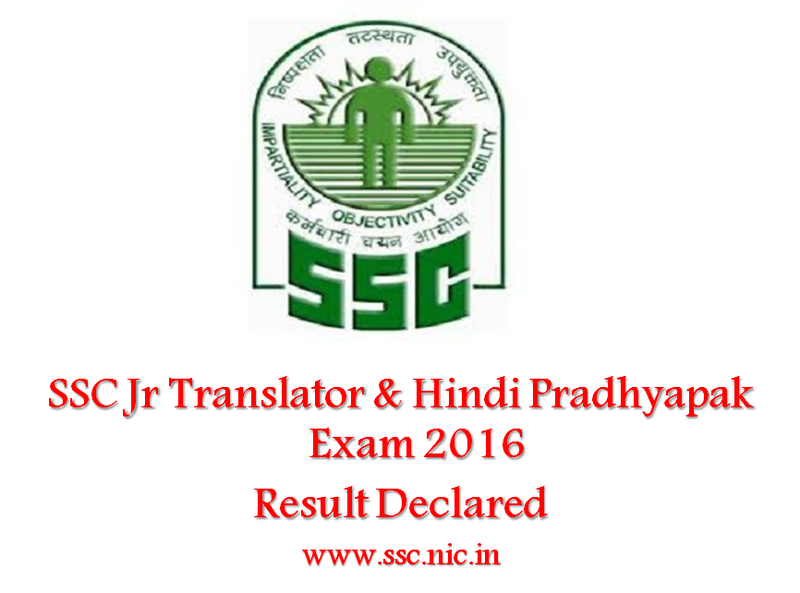 About SSC Jr Translator and Pradhyapak Exam 2016: Staff Selection Commission conducts written examination for recruitment to the posts of Junior Hindi Translators Examination, Junior Translators, Senior Translator and Hindi Pradhyapak. The exam is held every year to recruit fresher talents into the administrative section of the Commission.